This author has occasionally come up in Kindle Daily Deals. I had never heard of her and thought, for no particular reason, that she was a modern author writing of a different time period, the 1920s, 30s, and 40s, the Golden Age of Detective Fiction. I can't find a Wikipedia entry for Clara Benson, but there is a web site (http://clarabenson.com) for her and her books. It says she was born in 1890, in England I assume, and wrote several mysteries as a hobby when she was a young woman but never attempted to published them. After her death in 1965, her family found the books and is now publishing them. There seem to be six, with a seventh on the way. Based on word and phrase usage, some people think that Clara Benson is a contemporary writer. Either way, I enjoyed The Murder at Sissingham Hall and plan to read others in the series. Charles Knox has returned from eight years in South Africa. His old friend Bobs Buckley (no, I did not misspell 'Bobs'), heir to a vast fortune and member of one of England's oldest and most distinguished families, meets him at the pier. Before he knows what's happening, Bobs and his sister Sylvia whisk Charles off to a house party at Sissingham Hall. Sissingham is the home of Charles's ex-fiancee Rosamund and her wealthy, older husband, Sir Neville Strickland. Charles is still in love with Rosamund. Shortly after arriving, Sir Neville is found dead in his study. It appears that he had been drinking and fell against the mantelpiece, striking his head and killing himself. But appearances aren't always what they seem. One of the other guests, Rosamund's cousin, Mrs. Angela Marchmont, notices things that don't jibe with an accidental death. The doctor has questions, too. Soon there is a full scale investigation. Everyone must stay at Sissingham while the detective is at work. The guests do their own amateur investigating. One of the guests who stood to inherit a tidy sum of money from Sir Neville is arrested. His wife is then found almost dead from an overdose of sleeping medication. Still, something doesn't feel right. Mrs. Marchmont figures it all out and tells the detective her theory. They're just in time to prevent another murder. From the descriptions of the other books in the series, it appears that Mrs. Angela Marchmont is the recurring detective, solving mysteries she encounters as she travels around. Charles Knox narrates the story and Mrs. Marchmont doesn't seem to be a fully developed character, peripheral for most of the book. It will be interesting to see if she evolves as the series continues. I've adored Hugh Laurie for ages. I loved him in Black Adder, in Jeeves & Wooster, in movies, and I'm sure I'd love him in the TV show House, but I'm a borderline hypochondriac and can't watch any hospital / doctor show without coming down with the virus, bacterial infection, tumor, or broken bones of the week. Laurie is multitalented - an actor, a musician, a writer - and well-educated. A delight. 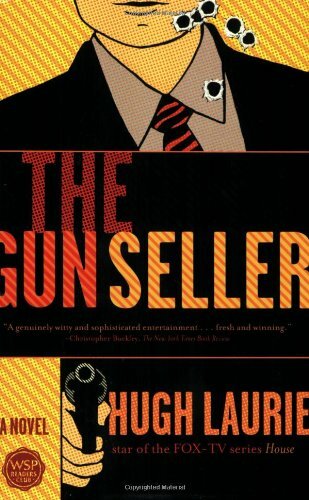 The Gun Seller is laced with glib dialog and amusing innuendo. Very droll, sophisticated, funny. Thomas Lang, the protagonist, fancies himself a James Bond type. Beautiful women, good whisky, motorcycles. But I had a difficult time following the story. Lang is ex-military and a freelance body guard who's asked to assassinate a wealthy businessman. He gets involved in a plot to start a war to sell weapons so some people can make a fortune. He also falls in love with Sarah Woolf, the daughter of one of the alleged gun sellers. But, as it turns out, her father is trying to stop the war. Lang infiltrates a terrorist group that's funded by the people trying to start a war. I think he does this on behalf of the British government and the CIA. Another woman, Ronnie, seems more promising as an aide and a romantic partner. She's delighted to help Lang with some of his reconnaissance and helps him out of a few tight situations. She likes the excitement and I like Ronnie. Lang ends up on the roof of the American embassy in Casablanca with the terrorists. The terrorists think they're waiting for a helicopter to take them to the place of their choice after winning a hostage situation. Lang thinks they're going to be obliterated by a new powerfully destructive war helicopter, one of the weapons the group of warmongers is hoping to sell. Hugh, it's not you. It's me. I've never understood spy novels. John le Carre, Eric Ambler, anything about the Cold War - not for me. I can never be sure who's who or why anyone is doing anything. I'm just a simple hypochondriac. Just a quick one for any Gladys Mitchell fans out there. 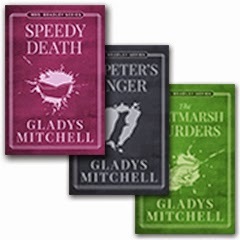 Today's Kindle Daily Deal features fifteen Gladys Mitchell mysteries for $1.99 each. That's amazing. Mitchell's books are hard to find in the US and any book at $1.99 is a steal. This is a post apropos of nothing. One of my grandnieces will be two on Sunday. I bought her a few things (books, Solmate mismatched socks, and a Jellycat stuffed hedgehog) and dug out a box to ship them to Manhattan in. While my back was turned, Turtle decided she liked her new house. I thought I might have to ship her off to NY with the gifts, but she finally got tired of the box and I grabbed it and packed it and took it off to the post office. 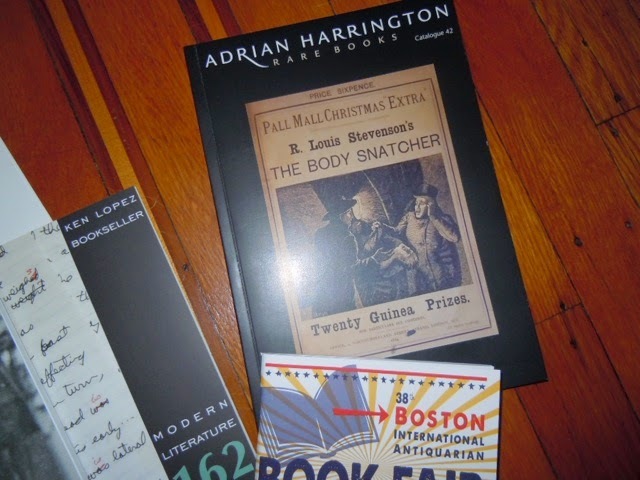 What Books Did I Buy in Boston? As mentioned in my previous post, we were in Boston this past week. Within a few blocks of the condo we rent at 21 Beacon Street, the old Bellevue Hotel, there are three wonderful used book shops: Commonwealth Books has two shops only a few blocks apart and Brattle Book Shop, 'one of America's oldest and largest antiquarian bookstores'. Brattle is where most of my library was purchased. In the 1980s, we lived on Beacon Hill and I worked at One Financial Center. I walked past Brattle on my way to and from work and to and from lunch, so I had lots of time to browse and buy. In those days, they had gorgeous sale books for $1 each. I bought a set of Robert Louis Stevenson, lots of Everyman's editions of the classics, Oxford Classics, and tons of other interesting books. I was building a library based on classics, with the assistance of Clifton Fadiman's The Lifetime Reading Plan. I used his book as a guide to the best of the best, sort of like the Harvard Classics, which I also have. I wrote to him when he was quite elderly and treasure the letter he wrote back. Not a lot of authors or celebrities, and he was one of those in his day, do that. He's the writer Anne Fadiman's father. This time, most of the books that came home with me came from Commonwealth Books. They are better arranged than Brattle's books, and I have to confess that I'm appalled that Brattle now puts price stickers on their books. Shame on any bookseller who puts anything sticky on a book! A light penciled price inside the front cover is the only acceptable method. So, without further ado, here are the books I bought, with one exception. Beatrix Potter's Gardening Life was given to me by my friend Jenny, a veterinarian, artist, and writer. We often give each other books. 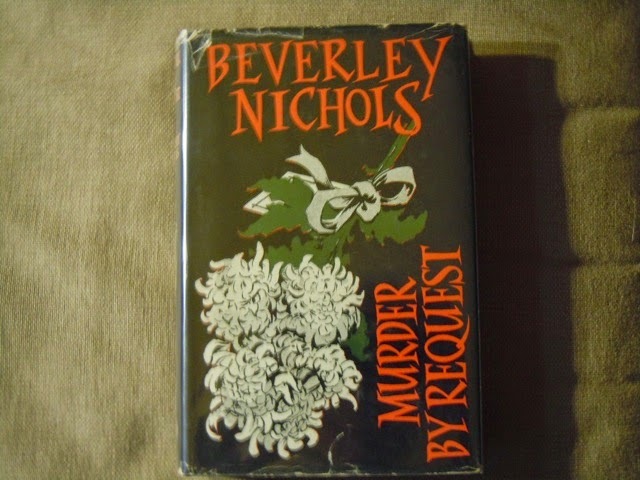 The two Angela Thirkell books, Miss Bunting and Close Quarters, and the Beverley Nichols mystery all came from Brattle. The others are from Commonwealth. 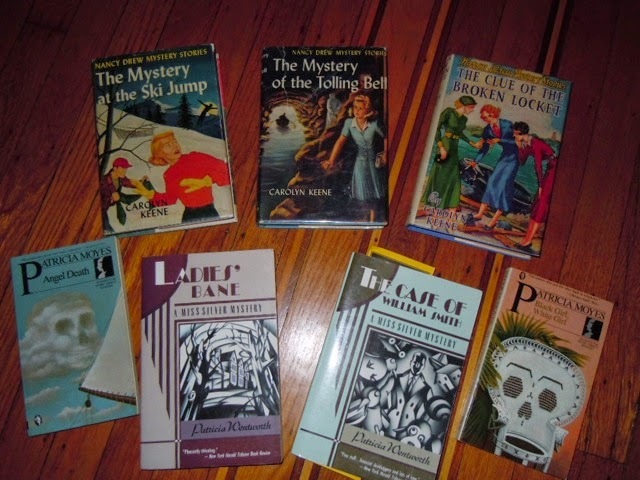 There are three Nancy Drew books, so I now have all but three of the original (not first editions) thirty-four books. 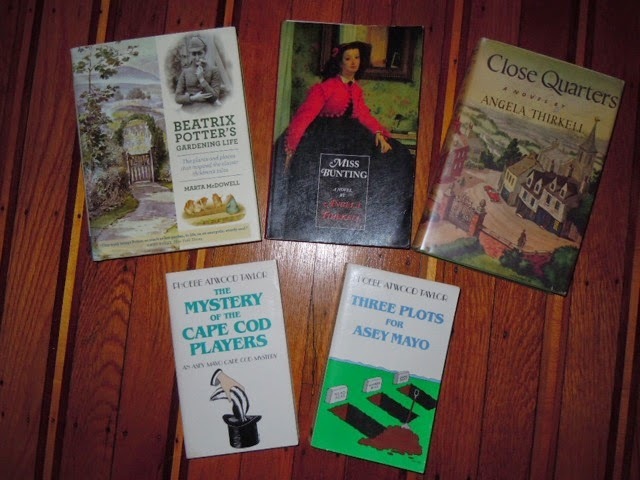 There are also a couple of mysteries by Patricia Wentworth, a couple by Patricia Moyes, and two more Phoebe Atwood Taylor Asey Mayo Cape Cod mysteries. Now, if you'll excuse me, I have books to read! This past week, Jack and I were in Boston. 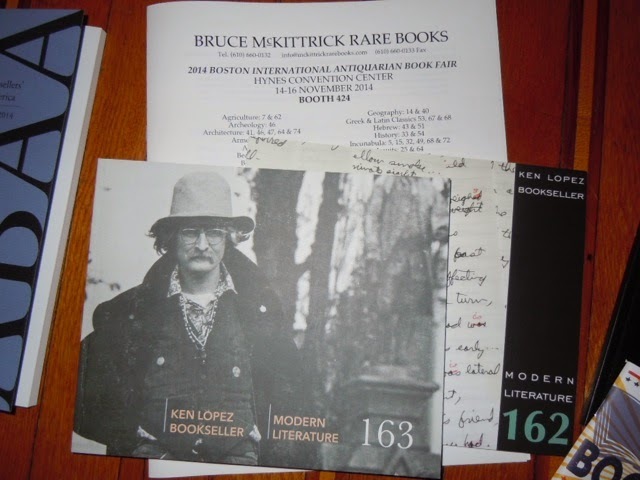 It just so happened that while we were there, the Boston International Antiquarian Book Fair was also there. I used to go to this all the time when we lived in Boston. I had friends who worked at Brattle Book Shop and often manned their both at the fair. The fair seemed smaller this year, but there were still 140 dealers, enough to keep anyone occupied for an afternoon or more. There were dealers from all over the country and from England, Russia, Germany, France, Canada, Hungary, Italy, the Netherlands, and Denmark. 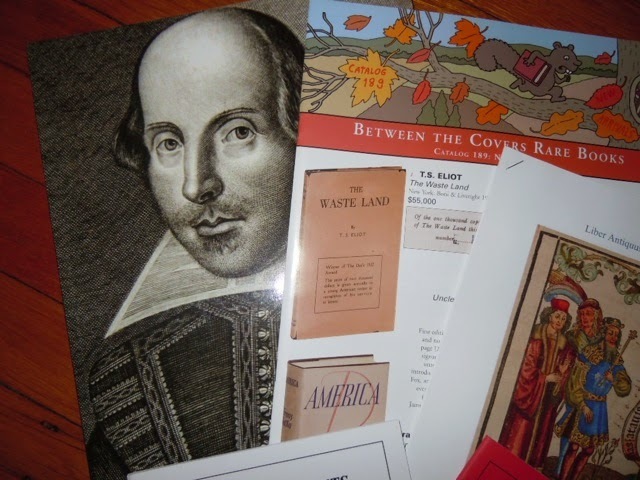 Books and manuscripts ranged from children's books, books from the Aldine press, mysteries, letters, modern first editions, and just about anything made of paper. Coincidentally, I started reading Castle Richmond by Anthony Trollope a few weeks ago and one of the items for sale was a page from that book in the author's hand! I forget how much they were asking for it, but too much for my pocketbook. Besides, I've decided I don't want the responsibility for caring for important or valuable things. I have my pretty books that I've collected over the years, most not worth more than $20 each at the most, and we can live together happily. 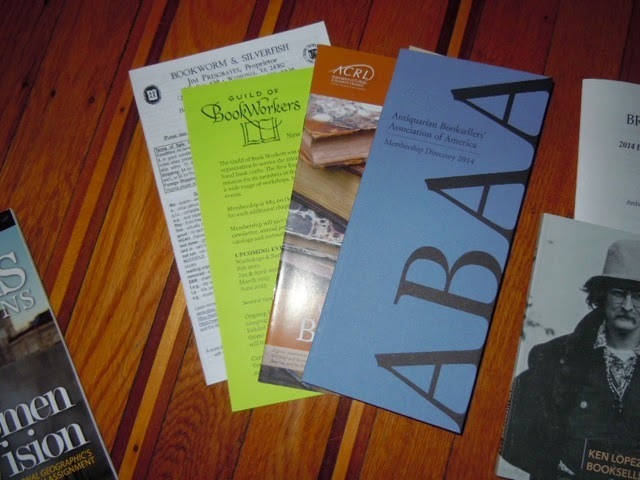 Another thing I like about the fair is all the free book catalogs. Here's a sample of my collection from the show. It's fun to look at the descriptions, to see what makes a book or a manuscript important and what the seller deems the value to be. 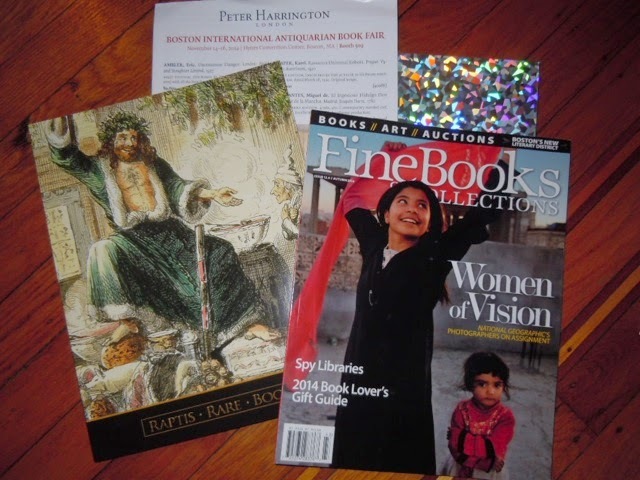 I think I may subscribe to the magazine in the first photo, Fine Books & Collections. It's hard to find good magazines about books, especially old books. 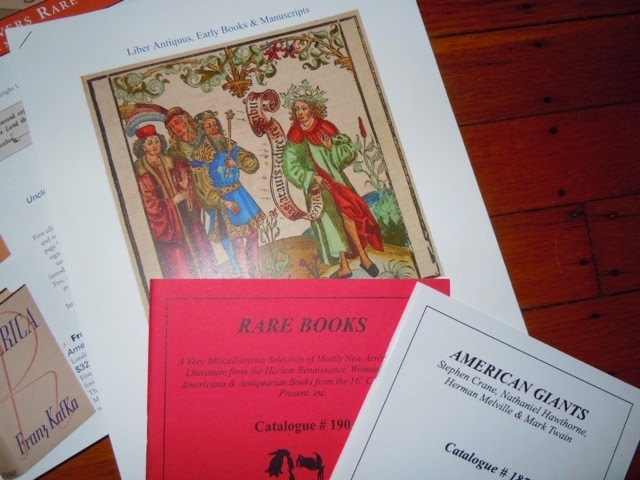 This is a glossy magazine with photos and articles about old books and manuscripts. They're offering a one year subscription (4 issues) for $19.98 and a two year subscription (8 issues) for $28.80. Seems like a good deal to me. Their web site is: WWW.FINEBOOKSMAGAZINE.COM. Hint: I was given or offered free passes to the fair at two used book stores. 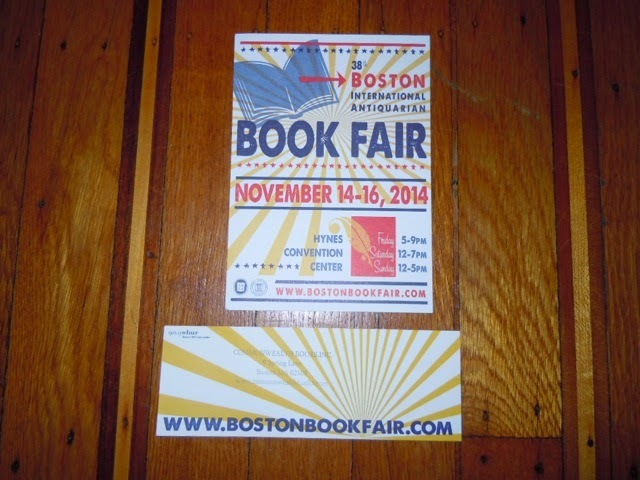 I was buying books at each shop and accepted one free pass to the fair. I imagine this would happen in any city, but it saved me $10.00 - which I promptly used to purchase a book! I had fun visiting almost every booth, but I didn't see anything I couldn't live without. I did find out that my Baedeker travel guides are worth more than I thought they were and that my A & C Black travel books may not be worth as much as they were a few years ago. I also think I have a first edition of a Hemingway, but the dust jacket is chipped and worn, so it may not be worth enough to buy that condo we looked at in Boston! Tampica is a fictional Caribbean island, newly independent from Great Britain. At the new nation's first reception in Washington, DC, the wife of the new ambassador kills herself after getting drunk and making a fool of herself. Or did she? After questions about her death arise, the ambassador is eager to find out what happened and to close the case. They don't want the DC police to be involved and they don't have their own crack detectives to ship up from the islands, so they decide it would be proper to have someone from Scotland Yard investigate. They ask for Inspector Henry Tibbett. 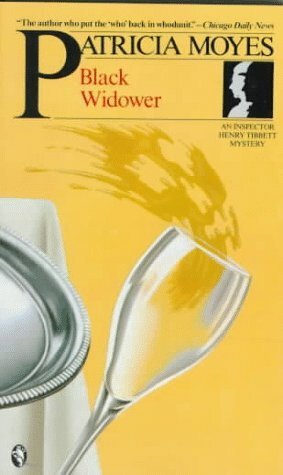 As Inspector Tibbett looks into the woman's death, he discovers that despite her sexually casual and fairly alcoholic past, she had been on her best behavior that night. She was not drunk, she was drugged. And she did not shoot herself, she was shot. Now all he has to do is discover who did it. This involves a trip to Tampica. He and his wife spend a few days in the sun and the surf, allegedly on vacation, while he talks to locals and discretely gathers information. They must rush back to DC when he realizes that their hostess there is in grave danger from the killer. The killer has killed the ambassador's wife and an employee at the embassy and is about to strike again. No, I'm not going to tell you who did it! What would be the point of reading the book then? It's a fairly short book, just a little over 200 pages, so if it sounds interesting, read it yourself! The American Minister to the Court of St. James, Hiram B. Otis, buys Canterville Chase, despite the presence of a ghost. He and his family are Americans and don't believe in things like ghosts. Besides, Americans were carting off all the good European stuff to America (so says Wilde), so if there were such a thing as a ghost, they would have imported one by now. They become believers after they move in to Canterville Chase. Sir Simon Canterville killed his wife three hundred years ago and disappeared nine years later. A blood stain on the sitting-room floor cannot be permanently eradicated. One of the Otis sons removes it with Pinkerton's Champion Stain Remover, much to the dismay of the Canterville ghost, who has to reapply the stain every time it's cleaned off. They leave oil out for the ghost to lubricate his chains so they don't clank so much. The ghost does his best to frighten the Otis's, but the Otis twins succeed in frightening him more. Poor old ghost! When the Otis's daughter, Virginia, finds him looking morose and tired, the ghost finally tell's her his woes. He admits he killed his wife, he says he's sorry, but he can't be dead, something he longs for, until his body is buried. Virginia agrees to pray for his sins to be forgiven and to help him to eternal rest. The ghost takes her to the secret room where his skeleton is chained to the wall. In revenge for killing his wife, he was left there to starve to death. Virginia is missing while she's away with the ghost. Her family is frantic, thinking she's been stolen by Gypsies or tramps. Or drowned in the carp pond. She reappears holding a small box of jewels that the ghost has given her for helping him. She tells the ghost's tale to her family and shows them the secret room and the skeleton. A few days later, the skeleton is buried with ceremony under the almond tree, under the silver moon, where the ghost will find peace at last in death. This is a lovely, sweet, funny short story or novella. I read it on my Kindle as a Project Gutenberg download. This is the second memoir I've read recently that deals with motherhood and children. Odd, since I'm not a mother and have never had the desire to be one. I chose the previous one, The Dog Stays in the Picture, because I thought it was about a dog. It was, but it was also about a family and a mother and her looming empty nest. I chose this one because it's a travel narrative, as well as a memoir about a father who died too young, the daughter who misses him, and her determination to create wonderful memories with her own daughter. Coburn's father, Shelly Coburn, was a musician who had a hit song called Only A Fool. He was the arty type, hard to pin down, but smart and philosophical. He was often away playing gigs, and he and the author's mother divorced after only a few years. He smoked a lot, both cigarettes and grass, and died of lung cancer at forty-nine. Coburn has unresolved issues with her father. She's convinced that she will die young, too, and she wants her daughter to have great memories of their time together. Her husband has a one-man law practice in San Diego and she's a writer. 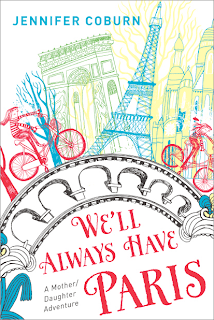 They don't have a lot of money, but she saves to take their daughter, Katie, to Paris when Katie is eight. Her husband stays home to keep the income flow steady. Coburn is also neurotic. Maybe almost as neurotic as I am. She gets sick on the flight over and Katie has to comfort her as she vomits in their hotel room. What has she done?! She doesn't speak French, so how can she safely shepherd her little girl around Paris? They manage quite well. This is not their only trip. Over the course of the next eight years, they return to Europe, seeing Italy, Amsterdam, and Paris again. Katie is an observant and bright girl. I enjoyed her easy attitude and her comments on the places they visited, their experiences, and the people they met. She teaches her mother a lot of things. There are flashbacks to the author's childhood with her mother and father, two very different people. I wondered why they ever married. Thirty years after her father's death, she still needs things from him. Or she thinks she does. But does she really only need to forgive herself, as her husband and daughter and mother all tell her? I enjoyed the book. It's a decent combination of family dynamics and travel narrative. I really think I'm hopeless at blog design! I got the last book photo in the right place, but I can't seem to move this one from the far left. Oh, well, a little variety is nice, yes? This is not the sort of book I read, ever. But I bought it in one of the Kindle Daily Deals quite a long time ago. I got the second one, too. Everyone was reading this at one point, and another blogger just posted that she'd read the first two since the third is coming out shortly (or may be out now). A couple of weeks before Halloween, I felt like reading a spooky book and I chose this one. It's about 580 pages, but it goes quickly. 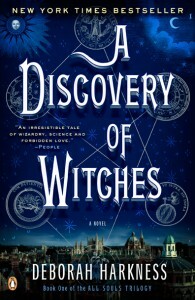 Diana Bishop is an historian and a witch, descended from generations of witches. She, however, does not want to use her witchy powers and has resisted all her life. Every now and then she uses them for little things. While doing research at the Bodleian Library in Oxford, Matthew de Clermont, a vampire, sees her use witchcraft to move a book from a top shelf to her hand. A manuscript referred to as Ashmole 782 is something that all the witches and vampires and demons have been seeking, and Diana has just unintentionally temporarily broken the spell that was put on it. Everyone wants to know how she did it. The powers of witches have been diminishing through the years. Diana has powers far greater than any other witches. Her parents had them, too, and witches killed them to try to find the source of their power. Now everyone is after Diana to find out why she's so powerful. She and Matthew fall in love. But it's against the rules for any creature (vampire, witch, or demon) to mate with / love a different kind of creature. Matthew and Diana defy the rules. They go to Matthew's mother's castle in France to elude the creatures hunting for Diana. As a vampire, Matthew's mother doesn't like witches, but she comes to accept that Diana is important to Matthew. She even comes to like her and protect her. The story moves to New York state, where Diana's aunts, Sarah and Emily, live. They raised her after her parents were killed. They're witches, too, and live in a house that is, well, let's say it's animated. It has a mind of its own, it knows when company is coming and creates new rooms for the guests. It shows displeasure by slamming doors, or acceptance by opening them. It creaks and groans. A war between the vampires, the witches, and the demons is brewing. Matthew calls the Knights of Lazarus to arms. Others are on their side, too, demons and witches and vampires who want to love whomever they choose. This could get interesting with all the occult powers flying around! I enjoyed the book despite my trepidation. I've never read any of the contemporary vampire or witch books, only the classics like Dracula and a few others. It's adventure, it's romance. This is clearly the first of a trilogy because it ends with Matthew and Diana timewalking back into the 1590s to escape the witch hunt and to find witches who still had great powers and could teach Diana how to use hers. At the end of the book - they're just gone. Nevada Barr doesn't churn out Anna Pigeon books fast enough for me. However, I missed this newest one, the 18th in the series, when it first came out. Anna Pigeon is aging but is back in top form. I race through these books. If I'm ever lost in the woods, I want Anna with me. Wait, with Anna with me, I'd never get lost in the woods! Anna Pigeon is an independent woman married to an ex-sheriff Episcopalian priest. She's not much of a God person. They have a mutually respectful and understanding relationship and are crazy in love. They don't agree on a lot of things, but they agree to disagree. Anna is the kind of woman who needs solitude and is regenerated by her connection with nature. She has been a National Park Service ranger for years and has been stationed in parks from Colorado to Key West to Michigan and more, spending a great deal of time fighting forest fires, trying to teach people how to behave in our national forests, and rescuing people who don't listen to her. There is a progression to this series, so it's nice if you can read them in order but it's not necessary. A group of women and girls - two mothers, one a paraplegic, and their teenage daughters - and Anna go off on a camping trip in Minnesota. They also have Wily, an older family dog. The paraplegic is trying out a new rugged terrain wheelchair that one of the other women invented. The inventor is along to assess its success. While Anna is off on a solitary canoe ride, four men appear in the camp and take the women hostage. The dog is kicked to the side when he tries to protect them. Anna hears the screams of the women and returns to suss out the situation. She's left her gun back home, but she always has her instincts and her nature skills with her. The men start marching the group to a rendezvous at an air strip in the woods. They are kidnapping the inventor and her daughter because she has millions of dollars. Later, it seems the leader of the group has a more personal interest in her. It's touch and go for a while, with Anna trailing the kidnappers and their hostages. The men are mostly city men, not used to trekking through the woods. They also don't know Anna is out there and will do whatever she has to to rescue the women. I love that she always knows what to do and does it. She pushes herself far beyond what most of us could do, both physically and mentally. From page one, this is an exciting book. I was rude to my husband ('can't you see I'm trying to read?!') because all I wanted to do was finish the book. Except now I have to wait for another couple of years for the next one. At least I hope there will be a next one. The author of this book is going to be at my fantastic local independent bookstore, Head House Books, in Philadelphia, on Wednesday (Nov. 5th), and after reading the book, I'm looking forward to the event. The author was an actress until she retired to raise her three children with actor David Morse. I didn't recognize him by name, but I recognized his face after Googling him. You probably will, too. They've been married for over thirty years, unusual in the film / TV industry. Most of the time, she's stayed home with the kids and he's been away on location filming. They moved to Philadelphia after surviving the terrible California earthquake in 1994. The children are either off at college (the girl) or about to go (the twin boys). Freedom looms for the couple. Susan will now be able to join her husband on location and they can rekindle their romance. Until she decides to adopt an ex-racing greyhound with issues. Racing greyhounds have never known family life or domesticity. They've spent their lives in a crate or chasing a mechanical rabbit around a track. Their professional lives are short. They have a lot to learn when they're adopted into a family. Fortunately, they're smart, sensitive dogs (which makes the thought of how they've been treated at race tracks deplorable). Some things Lilly learns quickly. But she immediately attaches herself to Susan as her rescuer and savior. She's extremely anxious if Susan's not with her - all the time. This is a problem. She also doesn't seem to like men, although that's not surprising considering that during her professional life, she was probably handled only by men. They don't have a pleasant association for her. The book relates the problems with Lilly, how they were resolved, and how they affected the lives of everyone in the family. It's a funny, honest book about a family that's not quite like other families but that has all the same problems. There are some stories about celebrities. There are stories about mysterious illnesses. College applications must be filed before the midnight deadline, but the fax machine isn't working. 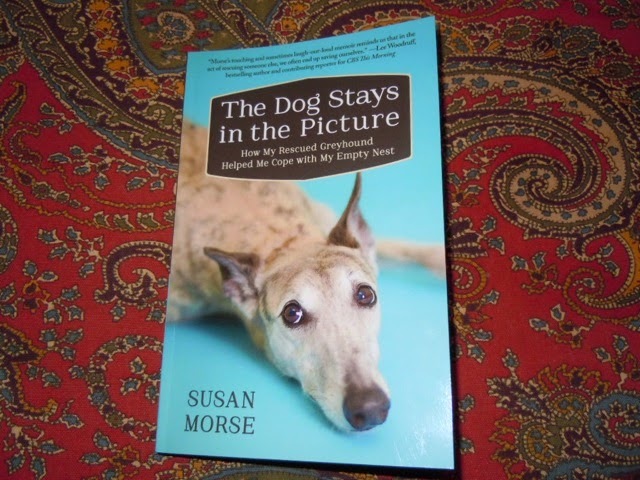 It doesn't end with the dog's death, which made it much more fun than a book like Marley and Me, which I have not read and will not read. Over the past eight years, I've held six of my darling pets in my arms while they peacefully left this life. That's too many too often and I don't want to read about anyone else's pet grief. That's not cathartic for me. 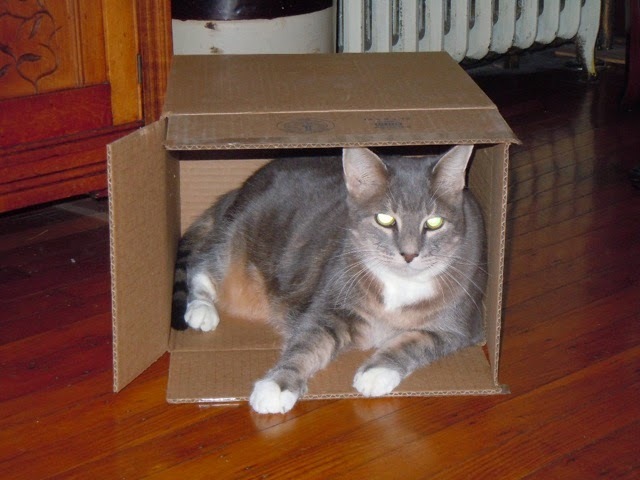 I'll continue to struggle with my PTSD, dreading our last remaining cat's death. We've shared our life with three Irish Wolfhounds, sighthounds, like greyhounds, and they seem to share some of the characteristics of greyhounds. Wolfhounds aren't used for commercial racing, so they tend to have better lives than greyhounds. But they often have difficulty with stairs (you try going up and down stairs on your hands and knees! ), they need to have their food and water elevated for better digestion, and they are huge lazy slugs most of the time. But they're gorgeous when they run. They are the sweetest dogs on earth, but have been known to knock people over when they lean against them, and ours have always befriended our numerous cats and kittens.